Hello and welcome to Episode #27 of the Mother’s Quest Podcast and the first of several I’ll be sharing for an initiative I’ve launched called Women Podcasters in Solidarity. The Initiative is a commitment I’ve made, alongside some other amazing women podcasters, to raise awareness and dollars to uncover and dismantle the ways racism, both conscious and unconscious, are impacting our society. I planned the Initiative after viewing the haunting video of Philando Castile’s death and of his girlfriend Diamond Reynolds and her young daughter in the back of the cop car in its aftermath. But, the events of Charlottesville since then have brought another level of urgency to this effort. 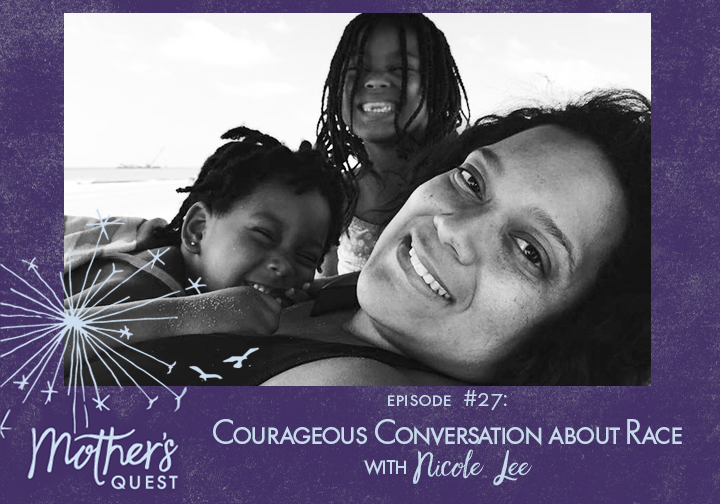 I’m so grateful that I found Nicole Lee, an incredible African American woman and mother, as our first guest on this topic, to light the way for how we as mothers, and especially those of us who are white women like myself, can take steps to make a difference, beginning with our own children and our own communities. Nicole is a strategist, executive coach and public policy advocate through her diversity and inclusion consulting firm, Lee Bayard Group, LLC. And she’s a practicing human rights attorney through the Black Movement Law Project she co-founded, which provides legal and strategy assistance to Black Lives Matter protestors and organizations. Social justice and human rights have been part of her character since she was a child where she got her pioneering spirit especially from her own mother, one of the first black women to be ordained in her Christian denomination. Nicole brings her experience as a mother and advocate to training parents in how to have courageous conversations with our children about diversity, inclusion and equity. I had the opportunity to learn from Nicole on a recent webinar on the subject, an overview for a more detailed class launching in September, that was also attended by Mallory Schlabach who offers this week’s dedication. Nicole and I start the episode with shared agreements and intentions for courageous conversation, committing to one another to come to the podcast recording with an open heart, a commitment to move through discomfort and risk imperfection. I vowed not to edit anything out and we both named a shared desire to plant seeds in mothers to raise awareness for themselves and their children. We explored how we can open channels of communication with our children, holding a “growth mindset” for them in relation to diversity, allowing them to make mistakes as they share what’s on their minds and not “shushing” them when they do. Nicole also shared the importance of expressing our values to our children in ways that they understand. When I asked her where we could invest in change, she challenged us to focus on our own communities and to identify some hard conversations we’ve been putting off. She emphasized the importance of introspective work to realize what’s in our way, determine what we need to be “ready” and then go get ready and have them. I committed to doing this work and to having Nicole join us to continue the conversation and give me an opportunity to check in on my progress in the private Mother’s Quest Facebook Group on Wednesday, September 13th at 11:30 am PST. As it has been for me, I hope this podcast episode, and the links and resources in the show notes, will be part of what you need to get ready to have the brave conversations with your own children and your own communities. As Nicole says at the end of our conversation, “we’ve got this.” We are not being asked to do anything that is not within our grasp. It’s not easy but we can get it done. Our challenge this week is to go back and process our own patterns and thinking about race, diversity and inclusion, to identify what courageous conversations we’ve been putting off, to get what we need to be ready, and then go have them. Ideas for investing and supporting the Movement for Black Lives and Nicole’s opinion that getting involved locally in advocacy on police relations, and having the hard conversations, in our own communities, are the most important steps we can take. After the events that took place in Charlottesville, I’m even more committed to a quest I’ve been on to understand the roots of racism and bigotry, how it still shows up today, and how I can become a better ally and advocate to fight against it. I’m raising awareness for myself, and inviting you to do the same, through this special podcast episode. I’m also pledging to donate to an organization supporting the Movement for Black Lives and to invite you to donate too leading up to Giving Tuesday in November. More on this to come soon. If you are a women podcaster yourself, I’d love for you to make a similar pledge to use the power of your platform for this cause. You can learn more and join the initiative by signing up at mothersquest.com/solidarity. You’re a mindful mother. And being present for your children in these years when you’re raising them is your highest priority. You’re also committed to making a positive impact in the world, something that feels even more important with all the challenges we currently face. If the description above sounds like you, the Mother’s Quest Circle Pilot, launching this fall may be right for you. This signature offering provides inspiration, coaching and community to spark your E.P.I.C. life with intimate in-person reflective sessions over 3-4 months. If you haven’t yet visited the website, head over to www.mothersquest.com to explore some of the ways you can get more connected. At the site, you can sign up for our email list (to get show notes delivered to your inbox and our new “Mothers on a Quest” features), click the link to join the Facebook group and press record to leave a voice message for me. You can also download the FREE Live Your E.P.I.C. Life Planning and Reflection Sheets. I’m rolling out my new coaching offerings and having great conversations with women who are ready to live a more E.P.I.C. life and interested in coaching. If you’ve had a spark moment setting you on a new path or are at a crossroads but feel unsure, guilty or overwhelmed, I’d love to talk with you about how working with me could help light the way, get you clear about what you want, shift your mindset from fear to faith, and get you moving into action. I’ve been there, I’m still on the journey myself, and I’d love to bring all I’ve learned from a decade of coaching, 13 years of motherhood and all the lessons from my podcast guests to support you. 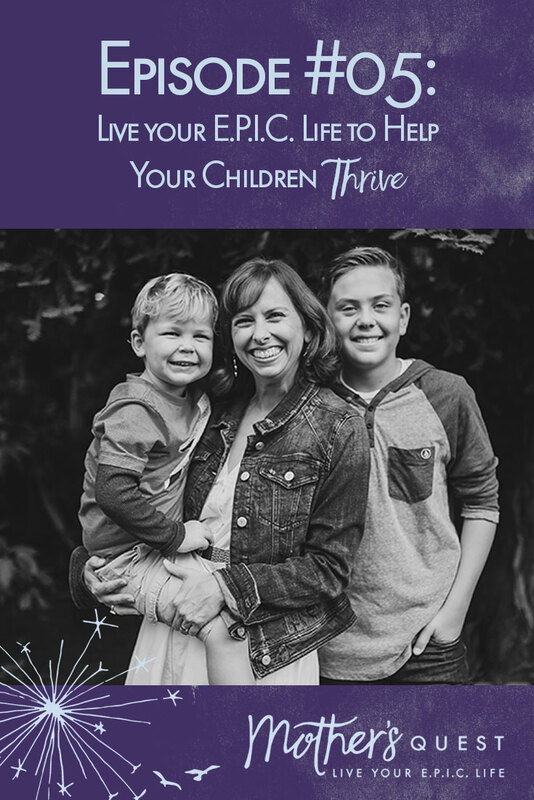 Send me an email at julie@mothersquest.com or sign up for a free discovery call by clicking this link if you’re interested in learning more.